UPDATE - John Boehner has been re-elected as Speaker of the House, though the number of Republican members voting against him more than doubled over 2013. The 25 "no" votes represent the most revolt tallies cast against any Speaker in more than a century. The uprising fell several votes shy of forcing a second ballot. A small handful of Democrats voted for someone other than Nancy Pelosi . (1) How many House Democrats will vote against Nancy Pelosi? She endured eight defections in 2013, and 20 in 2011, but her caucus is more liberal than ever. Many of her red and purple-district members have been wiped out. 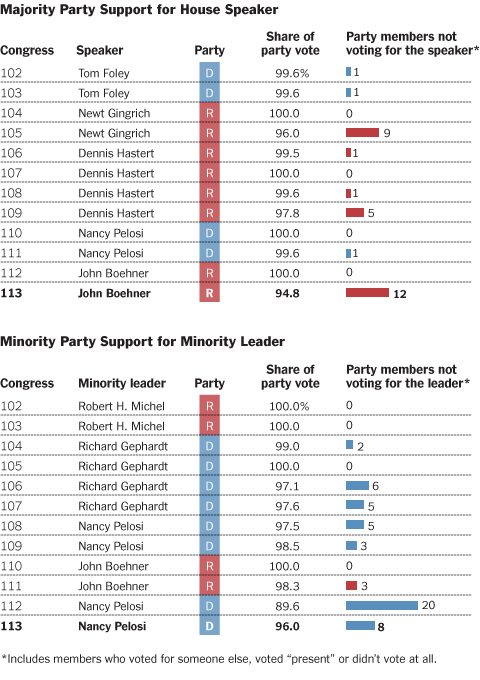 (2) Can the anti-Boehner contingent surpass their 2013 totals, either in raw votes, or in terms of caucus percentage (12 and five percent, respectively)? Save American Workers Act: Thousands of workers have seen their hours and wages slashed thanks to ObamaCare’s employer mandate that forces businesses to hold hours down to 30 per week or face a penalty. Women and low-income workers are particularly hard hit by the mandate, according to an analysis by the Hoover Institution, which found that the 30-hour rule puts 2.6 million Americans earning less than $30,000 a year - 63% of whom are women – at risk of having their hours and their wages cut. The Save American Workers Act restores the traditional 40-hour work week to protect these workers and help our economy grow.